I think I need to stop doing reviews of biopics for people I love and revere because I go in with too high of expectations for the movie to cover everything about the person and make it an enjoyable filmgoing experience, which is inherently impossible. The problem is that when you try to shove an entire life into a two hour and fifteen-minute movie, something is going to have to give, either story beats or proper pacing. Bohemian Rhapsody opted to keep as much of the story beats as possible and while it ended on a high note, the journey there was not without its issues. Bohemian Rhapsody tells the story of how Farrokh Bulsara, a baggage handler from Heathrow went on to become Freddie Mercury, arguably one of the greatest performers in the history of modern music. The movie opens with Queen as they prepare to play Live-Aid in 1985, before quickly throwing us back to London in 1970. Right off the start I was wondering why they even wasted precious time showing us where Queen would go when you’d be hard pressed to find anyone in the audience who doesn’t already know who Queen is, especially considering how much time is spent with the Live-Aid concert in the final act. What follows is a breakneck-paced first hour-and-a-half that covered a decade-and-a-half of Queen’s rise to power and fall, as well as Mercury’s early love with Mary Austin (Lucy Boynton) and his struggles to be true to himself. To give an example, in a matter of 20 minutes Brian May (Gwilym Lee) and Roger Taylor (Ben Hardy) go from being a band without a singer to Queen in their post Sheer Heart Attack fame about to embark on a world tour. It all happens so quickly that you aren’t given a moments respite to reflect on what is happening, and while it may work for the rock and roll lifestyle in a film you can’t put an audience into information overload and expect them to connect. Thankfully the more personal scenes between Mercury and Austin pump the brakes a little and allow us to really feel the doomed love between the two. Otherwise, the pacing doesn’t take a break until the third act where everything screeches to a halt as Freddie finds himself alone with his success and nobody to love. It’s only then that you are allowed to breathe and really feel the flaws in Mercury’s character that plagued him through his life, and see his attempts to rectify them in the face of death. So while the story ultimately ends in tragedy (if you didn’t know Mercury dies then get out) it’s still the films strongest point, which works in its favor. 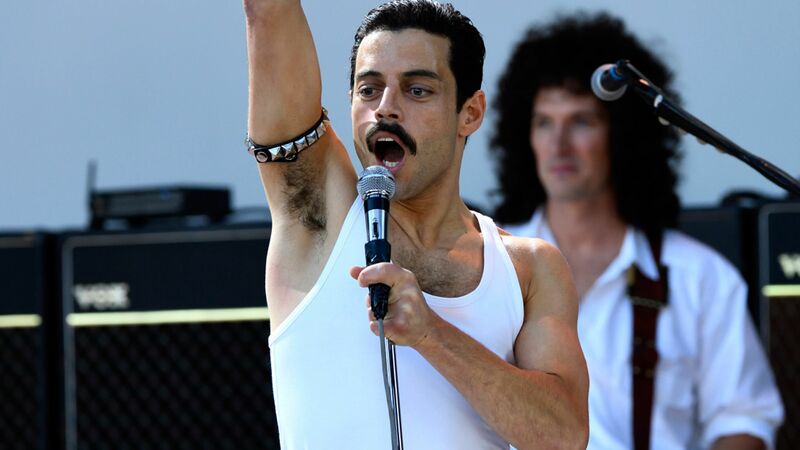 Rami Malek is nearly perfect as the eccentric Freddie Mercury. While Malek has one of the most easily recognizable young faces in the industry right now, through proper prosthetics and makeup you can really sink into the feeling of him being Mercury. The rest of Queen is also appropriately filled out with lesser known actors so as to not make you think it was just someone in a curly wig playing Brian May. As for the musical numbers, I do not know if it is bad filmmaking or due reverence to simply dub in Mercury’s vocals over Malek’s performances, but that’s what they do. Personally, I’m glad they didn’t try to have Malek do some bad impression of Mercury’s iconic voice but I wish they could have used some rougher cuts instead of studio tracks as it was quite jarring. You can tell someone on the production team heard the recently unearthed isolated vocal tracks from Queen’s history and had their fun with them. I did get a good laugh at the unintentional meta-humor of Queen protesting performing with a dub track on BBC while the film dubbed their tracks. The core issue Bohemian Rhapsody has is that it doesn’t know whether it is a Queen or Freddie Mercury biopic. While I can’t say which one I would have preferred more, what ultimately came out on screen feels like something fighting itself. There isn’t quite enough here for either the rock music or biopic fan to feel fully satisfied but it’s ultimately enjoyable. As a lifelong fan of Queen that unfortunately was born after their time in the spotlight, I only wish this was either longer or split into two parts, showing both the band and Mercury in the light that they both deserve.